As a high school teacher, Melinda Purviance could have spent her spring break relaxing alone. Instead she, with her husband Jeremy, guided nine teenagers from Parkview Adventist Academy (Canada), on a mission trip with Maranatha. “I wanted to give my students the same opportunity that I had [as a teenager]–to work hard, meet new people, see a new culture, and be drawn closer to Jesus through these experiences,” says Purviance. Her group wasn’t alone. Every spring, large numbers of Maranatha volunteers set out across the globe, determined to help people they’ve never met by building much-needed structures. In March and early April, 2018, Maranatha sent 547 volunteers to seven countries to work on churches, schools, and other local projects. More than half were first-time volunteers. David Lopez, Maranatha’s Director of Volunteer Projects, is directly involved with many of these volunteers. “March is an exciting time in the field for Maranatha. Affectionately known as ‘March-madness,’ our volunteer coordinators and field staff are at their busiest,” he says. But these volunteers are more than numbers; they make a direct impact on the lives of the local people they serve. Now, some have a place of worship where none existed before. For others, children will now have a proper learning environment. And in every interaction between volunteers and locals, God shined through and touched the volunteers as much as those they served. Lopez notes many volunteers don’t miss the traditional Spring Break vacation after serving on a Maranatha trip. “They will hesitate to go on another cruise or beach vacation when they can be part of making a difference in the world and see local attractions that are off the beaten path,” he shares. Purviance agrees. “Though I missed time off, it was such a rewarding experience, and I would 100 percent take a group again on a Maranatha trip,” she says. In Kenya, 75 volunteers from two Adventist academies worked at the Kiirua Adventist School and Getare Adventist Academy. 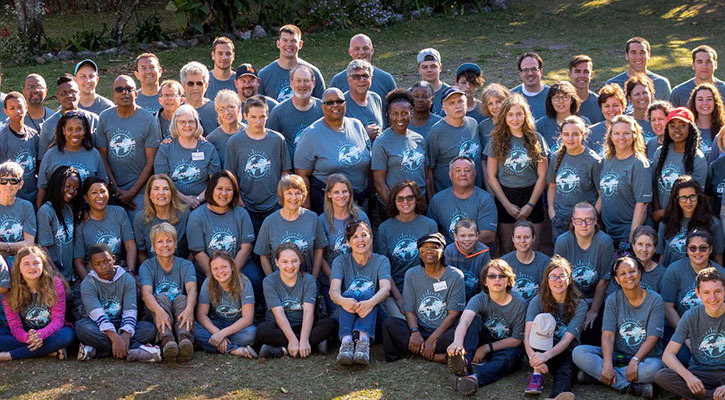 Forty-two served in Cuba, renovating the San Antonio de los Baños Adventist Church. In Bolivia, 80 more from two Adventist academies built churches. Fifty-one helped build the Georgetown Adventist Primary School in Guyana. In the United States, 94 volunteers worked on the Odessa Spanish Adventist Church (Texas) and Kingsville Adventist Church (Missouri). Thirty people served in Zimbabwe at Simangani. And in Panama a whopping 175 volunteers served in Panama, constructing the Algarrobos Adventist School and a church at Llano del Medio. If you would like to be one of these impactful Maranatha volunteers, register for an upcoming trip.